Members continued to raise key issues including the need for the treaty to: address corporate capture; shift from framing women as ‘victims’ or to be considered only during remedial processes towards incorporating a gender-responsive approach that situates women at the center of relevant processes; outline clear measures to ensure adequate access to information and documents; and the importance of both adhering to the UN Declaration on the Rights of Indigenous Peoples and using it as a guide to inform the treaty. Among other topics, States debated the suggestion of direct obligations for corporations, considered the possible implementation of a human rights due diligence requirement, and at least some began to echo civil society calls for the treaty to take a gender-responsive approach and to cover conflict situations. Discussions on access to justice highlighted the need to understand the treaty not as an academic exercise but as a necessary tool to address the significant injustices that area occurring, which are compounded by the reality that many affected persons are unable to access courts or remedies. The UN Special Rapporteur on hazardous substances and wastes highlighted the inseparable connection between environmental harm and human rights, and his experience of the lack of corporate human rights due diligence despite the existence of the UN Guiding Principles on human rights and business (which many corporations and some states argue are sufficient in securing corporate accountability). Various participants noted the need for state measures to be prospective in nature, as action only after harm occurs does not equate to justice for those affected given persistent access to justice barriers and the irreparable harm that cannot be addressed simply through damages payments, nor does it properly consider other key factors such as the impact of adverse corporate activity on future generations. 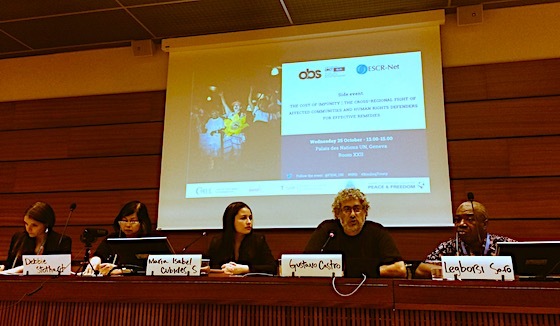 An ESCR-Net and FIDH side event focused on the importance of protection of, and creation of an enabling environment, for human rights defenders. Panellists included CAWG members Otros Mundos, MOSOP and Altsean Burma, as well as Sarah Brooks from ISHR, with moderation by FIDH. IGWG program of work: Access to justice, effective remedy and guarantees of non-repetition (cont. ); jurisdiction; international cooperation; mechanisms for promotion, implementation and monitoring; and general provisions.